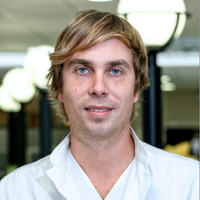 David Van Grembergen attained his degree as MD in 2006 at the Free University of Brussels, where he stayed for 3 years as a resident in general surgery. Afterwards he completed a 6 year training in Emergency Medicine at the University Hospital of Ghent, AZ Damiaan Oostende, OLV Hospital Aalst and AZ St Lucas Hospital Ghent. He graduated in 2014. Currently he works in the emergency departement at AZ St Lucas Hospital Ghent. He has special interests in trauma patients, teaching, prehospital care and the use of ultrasonography in the emergency departement. He lives in the Ghent area with his wife and 2 children. Main hobbies are running, tennis, and cooking.